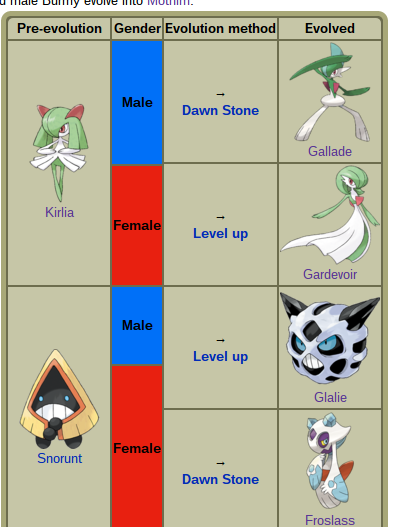 9 Gardevoir & Gallade; Glalie & Froslass. 20 "Gender unknown" over "genderless"
"Just like people, there are male and female POKéMON. But no one seems to have any idea how they're different." Gardevoir & Gallade; Glalie & Froslass. As I've said on my talk page, I was not aware that the mono-gender list does not already list all Pokemon regardless of whether they are listed elsewhere on the page, and I feel this is a mistake; also, there is a consensus against fanon for Bulbapedia as a whole (excluding the Appendix and Shipping namespaces), so each individual issue doesn't need a separate consensus on it. Finally, I did not revert you. TheOriginalOne did, then 0danmaster restored the section, and I reverted 0danmaster. In my personal opinion, this was not an edit war because no party reverted multiple times in a row, but I'll let the mods handle it as they will. "Then I moved later-introduced evolutions & pre-evolutions to be with their pre-existing family members." Using an order like that is more confusing than anything. There are two options, IMO. 1) Keep the table basically like it is and ONLY order the Pokemon by National Dex order. That means Tyrogue comes after Hitmonlee. Throh and Sawk are together because they're obviously "related", but they could be separate. Likewise with the Genies (who may actually present a challenge if done like that; they'll need borders, and I'm not sure that'd work out well, or else easily). Yeah, ^that, basically. Specifically: when I see something like Tauros sandwiched directly between Hitmontop and Throh, I become terribly confused about what order everyone's in. It just makes no immediately apparent sense. Well, because it's the National Order. I know the National Order. I've played every game more or less as it came out, or had my ear to the game news. I don't have any trouble, really, telling which Generation a Pokemon was in. Therefore, I also know its position in the National Pokedex relative to others. So when I see Tauros from Gen I between a Gen II and Gen V Pokemon, that's jarring. I think "Other single-gendered Pokemon" is a bad name for the section, because "Other" implies an original, a "Single-gendered Pokemon" section, or else "[SomeKindOf] single-gendered Pokemon" which has a separate set of single-gendered Pokemon. But there is no such section (not explicitly). In that whole "Pokemon" section, there's subheadings of "Gender Differences", "Related Species", and "Gender-based evolution". "Other single-gendered Pokemon" (the "Other" in particular) doesn't make sense among that company. "Other" as opposed to each of the former sections (aside from the gender differences, which really shouldn't be grouped with the rest) which each describe certain specific types of single-gendered Pokemon. I object to "Single-gendered Pokemon families" on two grounds: (1) because Pokemon that do not evolve are not part of an evolutionary family, and that list is wrong about this as well and I object to it on the same grounds; and (2) because we must either include something in the title to indicate that it is only talking about Pokemon not previously mentioned in earlier sections or repeat those Pokemon in this section. In the interest of avoiding redundancy, I prefer the former. This page was last edited on 24 May 2015, at 07:11.